When it comes to TV murder mysteries, you can’t go wrong with storage facilities and death masks. I mean you can, but thankfully the latest Garage Sale Mystery knows how to make use of mildly creepy plot devices. 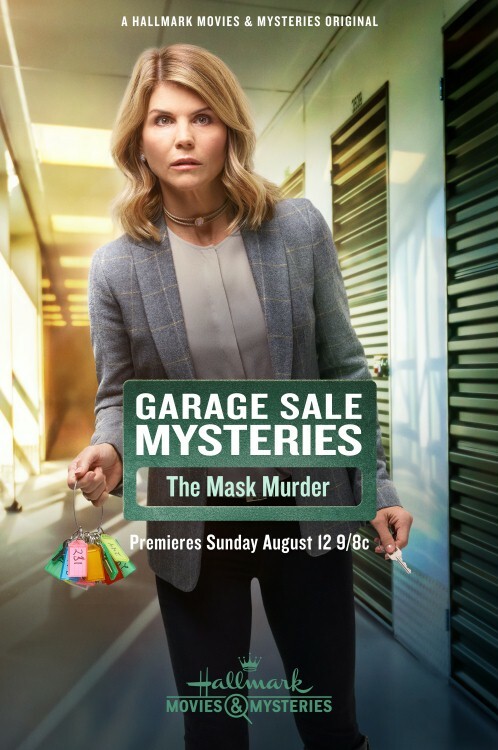 Jennifer Shannon (Lori Loughlin) finds herself at the scene of the crime again when a locker that’s up for auction yields a dead body in addition to a cache of valuables. As much as she tries to stay away from the official investigation, she can’t help herself and pokes her nose into the mystery anyway. I don’t know whether it’s bad luck that dead bodies keep sprouting up around her or good luck that she has a keen investigative sense. Either way, Jennifer seems to be the best detective in town and solves the case on her free time, when she’s not running her antique shop, Rags to Riches. That’s a lot to do since her business partner, Dani (Sarah Strange), is getting cozy with new boyfriend Drew (Matthew Harrison), leaving Jennifer alone to mull over details of the case. Carmen, the deceased, was an employee at the storage facility, and Jennifer and Detective Lynwood (Kevin O’Grady) quickly determine that a number of people connected to her could be responsible for the crime. Just before her death, she is seen arguing over the phone with her clingy ex-boyfriend, Gray (Jeffrey Ballard). Her shady, security footage-deleting employer, Michelle (Samantha Ferris), is also up to no good. Mr. Zetto (Michael P. Northey), a storage client who loses his inventory and thus his business when he can’t pay rent, might be at the top of the list though after Jennifer discovers a plaster mask bearing Carmen’s image among his belongings. The movie doesn’t have the macabre sensibility you might expect from a story about death masks. That’s because the masks don’t figure too much into the plot. It’s just one of several clues that lead Jennifer down the path to finding the real killer. The storage facility gives things a bit of an edge, by Hallmark standards, but if you’ve ever gotten lost in one of these mazes alone at night, you know the setting could have been a lot more tense than it is. The guessing game works though and had me suspecting a few people who turned out to be innocent. (You’re in the clear, Asian dude with the yellow bucket hat.) I also liked one of the two non-mystery subplots. Dani’s found some personal fulfillment at last, and I hope this means she won’t still be labeled as the quirky, middle-aged single lady. However, I’m not too keen on another case of Hannah (Eva Bourne) and her sorority sisters doing charity work but really just wanting to feel good about their largesse. This time she enlists her dad (Steve Bacic) to help build a tiny house, which I guess will include a subscription to Hallmark Movies and Mysteries. Highlight for spoilers: Damn, I thought it was the brother because always choose the least likely suspect. The murderer, however, turns out to be Gray’s new girlfriend, Jealous Amy. She confronts Carmen at the storage facility, and when the latter tries to warn her off her possessive boyfriend, they get in a tussle and Carmen bangs her head against a table. Meanwhile, sneaky Michelle and Whittaker aren’t killers, just your average small town thieves who use the business to steal valuables. Posted in USA, Western TV reviews and tagged crime, Hallmark Channel, Lori Loughlin, mystery films, TV movie on October 11, 2018 by limmer13.